Partnerships are important to us at GEO Jobe and to our business. The Esri Partner Program ensures that we are on the cutting edge when it comes to technology. In addition to having support from Esri and access to software,resources, and community we are also building our own network, and partnering up with other Esri Partner companies. 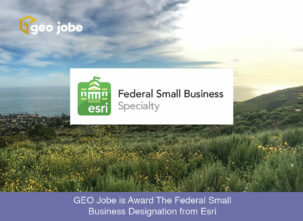 GEO Jobe has been involved in the launch of several apps in the ArcGIS Marketplace including Admin Tools (free and Pro), Mapfolio, and assisted with such apps as MapLapse and Mapillary for ArcGIS. Esri partners around the globe use industry knowledge and ArcGIS Platform expertise to solve your toughest challenges and take your business to the next level. Use Find a Partner to search for partners, solutions, services, content and complementary technology providers to meet your needs. For new players or companies new to ArcGIS there’s the Startup Program, a free three year program that gives emerging businesses the tools to build mapping and location analytics capabilities into their products. Qualifying startups receive online services, software, training and support, content, and other opportunities to help them succeed. Overall, the big benefits of partners at any level are access to support, training, professional services, and networking! Video – Esri Partner Network and the ArcGIS Marketplace – Extending the Platform!